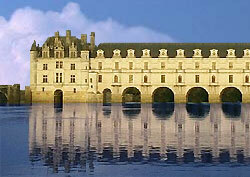 The Chenonceau Chateau is unquestionably the most beautiful of France's many Loire Valley chateaus. This addition houses a 60-meter (200-long) gallery used as a ballroom for lavish parties attended by France's nobility and power elite. You can take a tour through the furnished Chenonceau Chateau rooms. You see the Louis XIV sitting room, the Francois I bedroom, and the kitchens. Beyond the building are the Marques Tower, two gardens, and a wax museum. During the evening, you can enjoy a Son et Lumiere light show.